Working on the show for so many years is bound to create some amazing memories, wonderful friendships, and incredible bonds, but one thing is for sure, “Teen Wolf” has not only allowed for that to happen to the cast-mates of the show, but also to all of the fans of “Teen Wolf” as well. Tyler Posey, who has taken on the fan-favorite role of Scott McCall and brought him and his high school / Alpha wolf adventures to life, is certainly one iconic actor. For a show to last all these years and manage to captivate, entertain, and leave fans absolutely and completely mesmerized as each episode goes by, now that’s how you now you have a masterpiece of a TV show. Tyler Posey and the cast of “Teen Wolf” has managed to make viewers feel an extra special feeling in the air each time a new episode (or even a rerun) of “Teen Wolf” airs. The show has brought us all happiness, love, laughter, tears, and many, many moments that have left us at the edge of our seats. Although this may be the sixth and final season of “Teen Wolf,” this show has already become a legendary MTV show that has made entertainment history in more ways than imaginable. Tyler Posey’s effortless and stupendous acting talent has allowed us all to join Scott McCall through the journey we like to call life. His impeccable, indescribable, and extraordinary acting skills has helped make a show that is all about strength, loyalty, bravery, and doing everything you can to always protect and show your love for the people you care about the most. Tyler Posey has managed to bring old fans and new “Teen Wolf” fans together and one thing that this consummate actor and musician never fails to do is always reflect how grateful he is to have his fans and “Teen Wolf” supporters. Tyler Posey is someone who can always bring joy to people and make everyone smile from ear to ear. He has such an outgoing and vibrant personality both on and off-screen which makes him someone who is, without a doubt, just an incredible pleasure to work with. For a show to last a total of six, marvelous seasons there has to be a lot of things: great talent, hard-work, wonderful chemistry amongst cast-mates, and a terrific storyline for a show – “Teen Wolf” has all of that and more. It’s so great to see that despite all of his massive success, despite being known worldwide for his remarkable acting talent, despite being a part of a show that has really made such an impact in the lives of many – Tyler Posey remains so humble and down-to-earth. Tyler Posey has taught us to be a leader of our pack and we’ll never forget how much “Teen Wolf” has touched the lives of so many people. 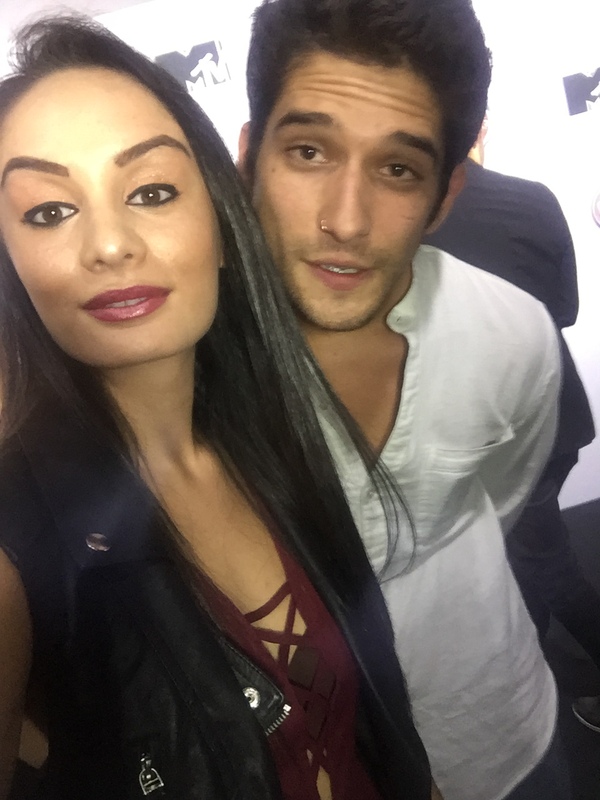 I, Alexisjoyvipaccess had the greatest honor of covering MTV’s outstanding “Teen Wolf” and “Sweet / Vicious” premiere party and had the honor of interviewing the profound actor Tyler Posey at the event. Tyler Posey dished exclusively to Alexisjoyvipaccess all about what it is like for him to have been a part of such a spectacular show, what kind of spin-off series he would like to make about “Teen Wolf,” and he takes on a fun speed round where he spills on something fans may not know about him, what his favorite song is at the moment, and more only in our VIPAccessEXCLUSIVE interview. Since a big part of this sixth season of “Teen Wolf” are the new villains, the Ghost Riders, who have the ability to wipe out the memories of individuals – Tyler Posey even spills on which character he would like to see have his memory get wiped away and what is one thing he would like the character to remember (PS – get ready to get a box of tissues because it’s about to give you some MAJOR Teen Wolf feels) – hear what he had to say in our VIPAccessEXCLUSIVE interview below. Thanks for the excellent interview, Tyler – it was so wonderful chatting with you! Previous VIPAccessEXCLUSIVE: The Extraordinary JR Bourne Interview With Alexisjoyvipaccess At MTV’s “Teen Wolf” Premiere Party! Next VIPAccessEXCLUSIVE: The Spectacular Holland Roden Interview With Alexisjoyvipaccess At MTV’s “Teen Wolf” Premiere Party!